Protect your statements of accounts, insurance policies, contracts, invoices, mistyped letters or notes from prying eyes! 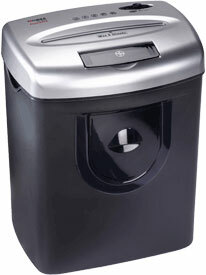 Dahle 21062 Document shredder with automatic start/stop and reverse function. Motor cuts out automatically on raising the top part. 2 cutters for paper as well as CDs, DVDs, cheque and credit cards. Standby mode without using electricity.